Burning mouth syndrome (BMS) is characterized by a burning pain in the mouth - specifically burning tongue - that has no apparent cause. Women who suffer from this symptom often describe it as a sore tongue, adding to the general overall discomfort and sending them searching for relief. Continue reading to learn more about sore tongue medicines, from conventional to alternative options that will help you find the reprieve you need from this unsettling hormonal imbalance symptom. Treatment for sore tongue, and burning mouth syndrome in general, should start with determining the underlying cause of the condition. For those suffering from primary burning mouth syndrome, the condition is related to taste and sensory nerve issues. Therefore, treatment will focus on lessening symptoms since there is no known cure for this type. For those suffering from secondary burning mouth syndrome, it is caused by an underlying medical condition, such as hormonal imbalance in menopausal women. So, treatment will push curing the initial disorder to relieve symptoms. When sore tongue is caused by drastic hormonal fluctuations, the first line of conventional treatment will be hormone replacement therapy (HRT). During HRT, women are prescribed exogenous hormones to resolve deficiencies, namely of estrogen and progesterone. By introducing external hormones into their systems, symptoms of hormonal imbalance often dissipate rapidly. However, serious risks are involved, such as an increased risk of breast cancer, uterine cancer, and more. Other conventional sore tongue medicines include medications that block nerve pain, such as anticonvulsants, certain antidepressants, and capsaicin, which is derived from chili peppers. You may also be recommended to use prescription-strength oral rinses or lidocaine, a type of local anesthetic. 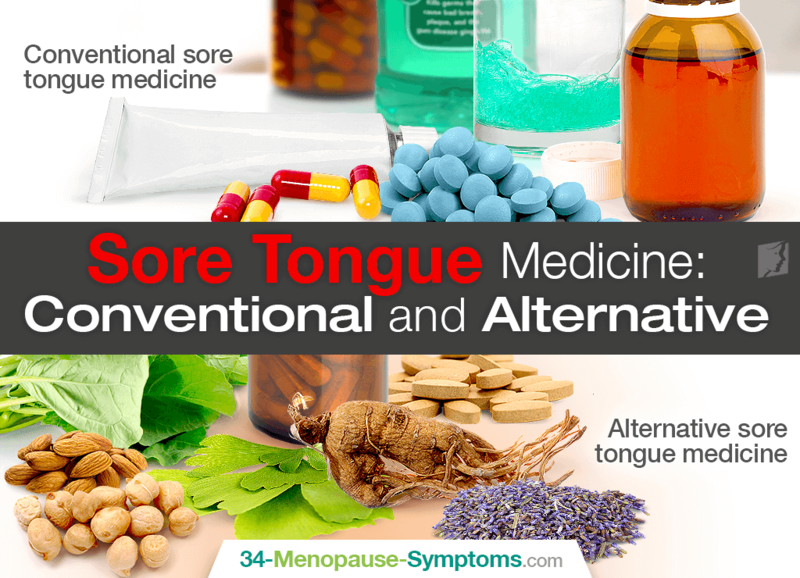 Women suffering from BMS and sore tongue due to the menopausal transition have several options available to them as alternative treatments. Alongside alternative sore tongue medicines, women should make lifestyle changes for better results, such as optimizing their diets with foods rich in iron, zinc, and B-complex vitamins - as their deficiencies can exacerbate the condition - and phytoestrogens, which help fill the hormonal gap. Also, avoid any excessive mouth irritations, including using abrasive toothpastes and over brushing your tongue. Then, women may complement this healthy diet and habits with alternative medicines of phytoestrogenic herbal supplements - chaste tree berry, ginkgo, ginseng, etc. - and hormone-regulating supplements, like Macafem. These can be considered a safe and effective way to combat sore tongue by nourishing the endocrine system to produce its own hormones, thus resolving the hormonal imbalance causing menopausal BMS. Burning mouth syndrome - which includes symptoms of burning and sore tongue - doesn't have to be signed off as yet another mysterious menopause symptom without an end. There are numerous burning tongue treatments available to you, including conventional choices of HRT (with associated side effects), anticonvulsants, antidepressants, and anesthetics in addition to alternative selections of phytoestrogenic herbal supplements or hormone-regulating supplements. Almost 90% of women suffer from burning mouth syndrome (BMS), and it rarely occurs in women younger than 30 years old.Say goodbye to a burning mouth sensation forever and regain control over your life. Click here to find out how to cure BMS. Burning tongue sensation is a rare symptom of menopause. Click here to learn how to cool it down.